(Leah Hogsten | The Salt Lake Tribune) Amjed Aldahalk takes a picture of his daughter Huda, 10, and son, Mohammed, 11, with Santa Claus at A Shepherd's Gathering welcoming holiday party, December 15, 2017 for Utah's refugee families. The Aldahalk family came from Bagdad, Iraq in 2016. The party is sponsored by the Utah Refugee Center, The Granite Education Foundation and The Refugee & Immigrant Center-Asian Association of Utah. 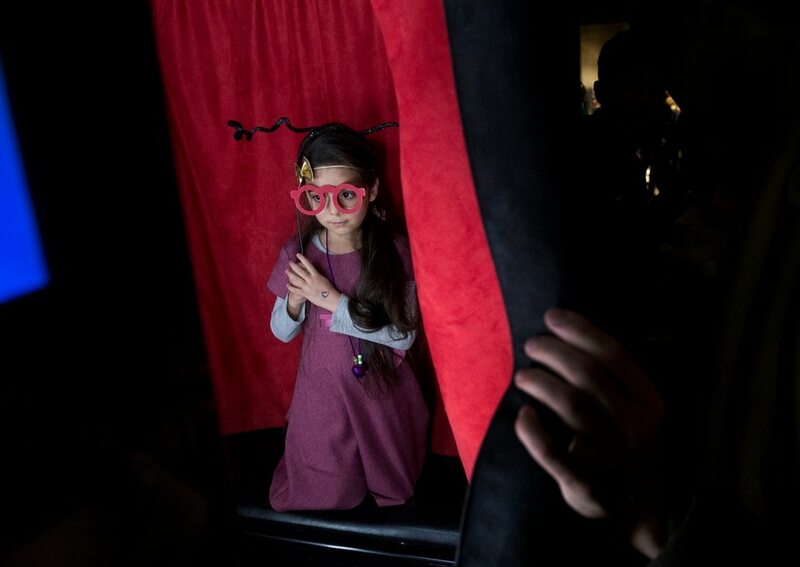 (Leah Hogsten | The Salt Lake Tribune) l-r Iraqi refugee Noorseen Noory, 5, poses for pictures in a portrait booth at A Shepherd's Gathering welcoming holiday party, December 15, 2017 for Utah's refugee families. The party is sponsored by the Utah Refugee Center, The Granite Education Foundation and The Refugee & Immigrant Center-Asian Association of Utah. (Leah Hogsten | The Salt Lake Tribune) A Shepherd's Gathering welcoming holiday party, December 15, 2017 for Utah's refugee families. The party is sponsored by the Utah Refugee Center, The Granite Education Foundation and The Refugee & Immigrant Center-Asian Association of Utah. (Leah Hogsten | The Salt Lake Tribune) l-r Iraqi refugee Maryam Raheem and her children Ahmed and Amal pose for pictures in a portrait booth at A Shepherd's Gathering welcoming holiday party, December 15, 2017 for Utah's refugee families. The party is sponsored by the Utah Refugee Center, The Granite Education Foundation and The Refugee & Immigrant Center-Asian Association of Utah. (Leah Hogsten | The Salt Lake Tribune) Volunteer Elle Stoker, 15, poses with refugees during a short break from playing tag at A Shepherd's Gathering welcoming holiday party, December 15, 2017 for Utah's refugee families. The party is sponsored by the Utah Refugee Center, The Granite Education Foundation and The Refugee & Immigrant Center-Asian Association of Utah. (Leah Hogsten | The Salt Lake Tribune) Volunteer Sara Jennings helps Musawir Mujadidi, 4, make a jingle bell necklace at A Shepherd's Gathering welcoming holiday party, December 15, 2017 for Utah's refugee families. The party is sponsored by the Utah Refugee Center, The Granite Education Foundation and The Refugee & Immigrant Center-Asian Association of Utah. (Leah Hogsten | The Salt Lake Tribune) Kamar Alsafar, 5, who will turn 5-years old on Christmas Day, shows off her decorated Christmas tree at A Shepherd's Gathering welcoming holiday party, December 15, 2017 for Utah's refugee families. Alsafar and her family arrived in Utah from Bagdad, Iraq in 2011. The party is sponsored by the Utah Refugee Center, The Granite Education Foundation and The Refugee & Immigrant Center-Asian Association of Utah. (Leah Hogsten | The Salt Lake Tribune) l-r Melak Rashid, Fatima Alsafar, Diyar Almsalookhi and Waled Abdel Azziz at A Shepherd's Gathering welcoming holiday party, December 15, 2017 for Utah's refugee families. The party is sponsored by the Utah Refugee Center, The Granite Education Foundation and The Refugee & Immigrant Center-Asian Association of Utah. 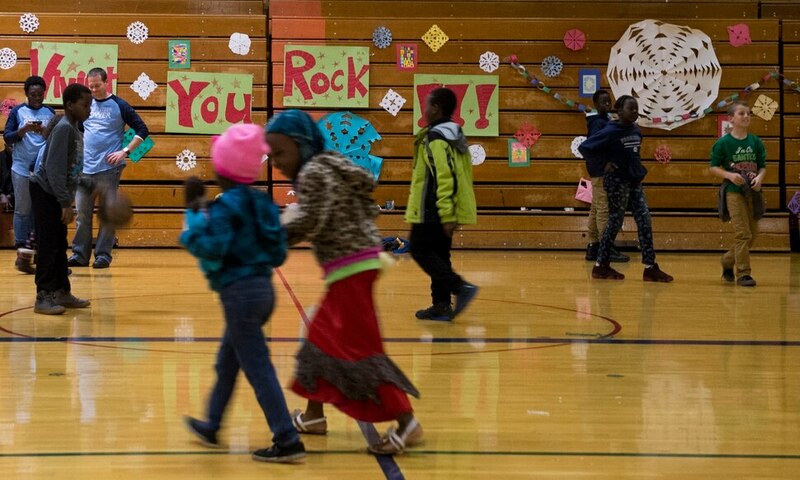 Utah Refugee Connection and Granite School District threw a holiday party for refugee families at Lincoln Elementary School on Friday night. The school’s principal, Milton Collins, filled in for Santa Claus. Kids took turns sitting next to Santa, on a giant red armchair, as he asked them about their goals, school and how they were helping their parents. 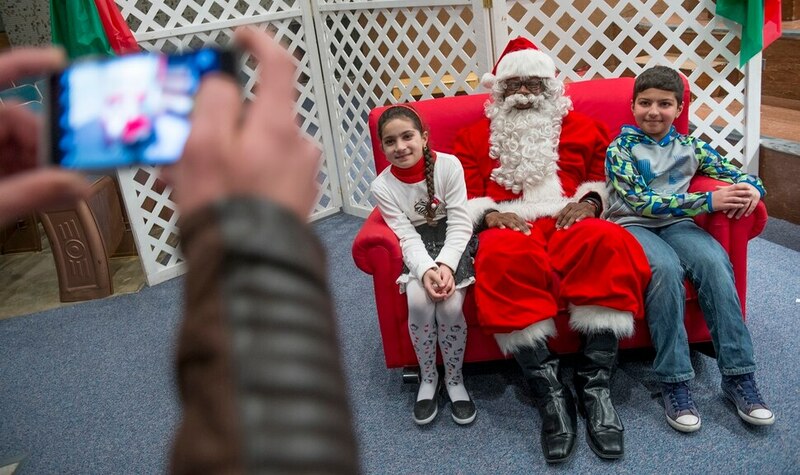 “This Santa doesn’t ask, ‘What do you want for Christmas?’ because some of them won’t get something for Christmas,” said Amy Dott Harmer, director of Utah Refugee Connection. But each child did receive at least one gift during the party: a handmade teddy bear or doll — some with hijabs, some without. 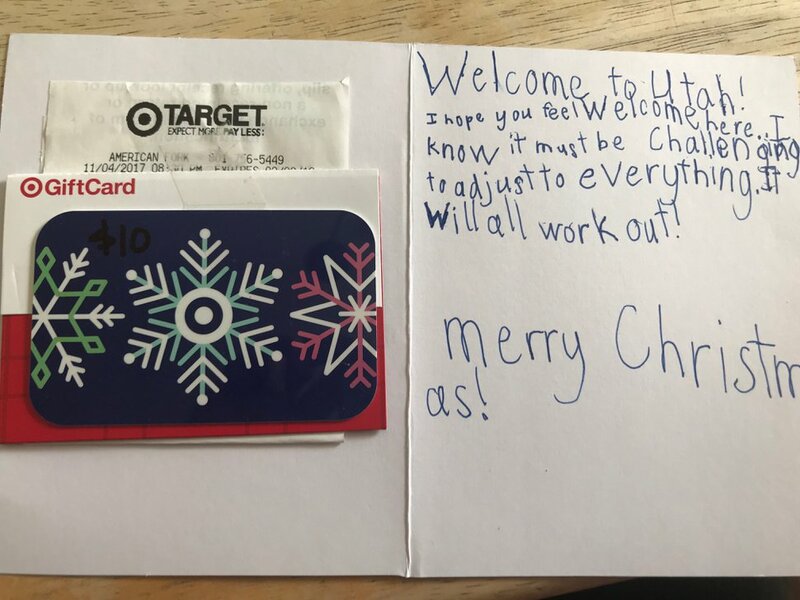 (Courtesy of Utah Refugee Connection) Members of the community donated gift cards to give to refugees at a holiday party on Friday evening at Lincoln Elementary School. “Every child needs something to give them comfort,” said Sarah Parson, whose Dolls of Hope provided the bears and dolls. Two small Iraqi boys in matching red and green elf hats sat on a giant red armchair on either side of Santa Claus on Friday evening. The younger of the two, a 7-month-old, stared up at Santa. His 19-month-old brother sat on the edge of the chair and looked ahead at his parents, who were snapping photos. The two boys had lived in Iraq with their mother until a month ago, when they came to Utah as refugees. Events like this one help new arrivals adjust, he said. Because refugees come from many faiths, the party didn’t emphasize any one religion. “We want it to be a party,” Harmer said. “We have Santa because we know that there are some families that want to see Santa. But we purposefully try not to make it overly Christian, or overly Christmas,” so no one feels excluded. Activities included face painting, dancing and a photo booth. Refreshments were served. Everything — including the food and gift cards — was donated, Harmer said. Donors attached notes for the refugees as well. (Photo courtesy Utah Refugee Connection) Members of the community donated gift cards to give to refugees at a holiday party on Friday evening at Lincoln Elementary School. Getting things to work out is the goal, Harmer said, so her group links refugees to what they need, whether that be food, comfort or a friend. Yvette Bwende, who emigrated with her family from the Democratic Republic of Congo in 2011, thanked Utah and the organizers for the event.